Asian Immigrants; have you ever seen a real fat sloppy one? Ok ok. Yes nothing beats American BBQ . Jamacain isn't bad either but spicey . I'm not talking about the American BBQ. There were actual Mexicans working at a Korean BBQ restaurant. LOL! Your friend is pulling your leg. I was stationed in Korea Camp Casey few yrs back and there are heavy Asian's however it's rare now that I think of it . A size 10/12 isn't considered heavy there . Keep in mind as a whole Korean women are not to curvy and Korean men not exactly broad . Its a different built. Seoul is very pretty unreal bus service and spotless. Magnificent furniture but not cheap . When I went to Malaysia, I was by far the largest person there. Let's put it this way, I was mortified trying on a bikini bottom. Now, I've heard that in some areas of asia, don't know where specifically, maybe China, the obesity rate is rising. Why? Because of the influx of western fast food restaurants, KFC is apparently huge there. Now THAT is embarrassing, seeing our fatness spread to other countries. Lol but I am sure you will agree most women have more curves than Asian women. It's a different built . I have never been to Malaysia heard it's interesting. I don't have weight problem as work out and active but if I don't stop eating close to a gallon of REAL ice cream every 2 day's (I mix in MM's )and KFC when I want whole bucket with poured in gravy I will lol . Some Asian men are kind of curvy however. The Japanese lady has the German lady beat as far as curviness. Yes, there are a few fat Asians, but very few. What I was getting at is the Asians I meet here in the Pacific Northwest are more concerned with their appearance. Weight is just one aspect. I see less Asians who wear sloppy clothes, desperately need a haircut, look like drug addicts and seem to have given up on themselves. I strongly believe in stereotypes as being true in most cases. While there is a share of Asians who are fat, sloppy, criminal and lazy, they are few and far between. Asians are the model immigrants. Every statistic about their demographics will tell you so. In all fairness: it is much harder to cross the oceans (both legally and illegally) than simply 'jump our southern border' so that separates the wheat from the chaff immediately. No one is holding a gun to the locals' heads to eat our style food. There is a direct relationship between population density and obesity. In countries (or cities) with a high pedestrian rate, they are thinner, regardless of diet. Cultures that still have a high level of physical labor are thinner also. If one looks back a hundred years, diets were probably worse than today. Meat, dairy, etc. were the norm. The difference was the amount of physical activity of the average person then versus now. In the United States, the thinnest people are those in "active areas". These include Colorado and New Mexico, as well as parts of the Pacific Northwest where outdoor activity is an important part of life. Those living in NYC are overall less obese compared to those living in other large cities. The regional diets of the PNW and the SW are generally healthier than the midwest and south. The fattest live in the South. This has been attributed to both the horrible climate (too hot to do anything) as well as the regional preference for frying everything. Lol top pic is Hawaiin. 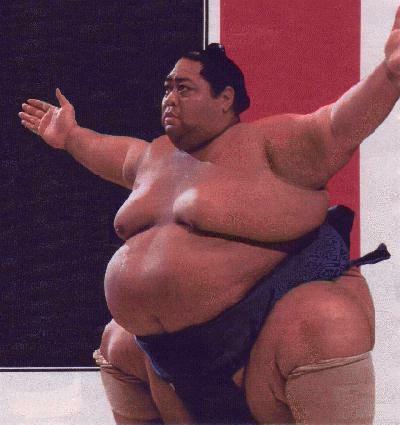 I watch sumo wrestling lol he was one of the few non Japanese Sumo's . He was a champ but his knee's became weak. Not sure why lol.